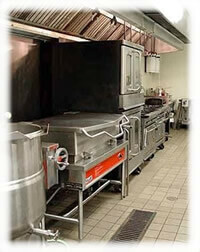 Many restaurant owners like to believe they are on top of the cleanliness of their restaurant. Kitchen restaurant pressure cleaning is imperative, particularly in a day and age when someone can post a review and picture of your dirty restaurant before you realize what hit you, you had better guarantee you are all about having a spotless restaurant. You may have a highly skilled staff that stays on top of cleaning the forks, knifes, spoons and plates every day. Perhaps they even have a high pressure steam dish washer to help them. Wiping down the tables, washing dishes and cooking equipment, vacuuming the floor and cleaning the bathrooms are other tasks that are (or should be) done daily. But these tasks are only the first step. There is no shortage of areas to clean in a restaurant - in addition to the cleaning tasks mentioned above; ducts, signage, dumpster areas and the parking lot all need consistent cleaning. Such an array of surfaces that need to be cleaned frequently demands a cleaning solution that is easy to use, flexible and affordable. This is why a pressure washer is a necessity for those in the restaurant business. The ability to hook up a pressure washer and start cleaning within minutes is invaluable - particularly a cleaning solution that offers so much flexibility due to the number of attachments that can be used. Here is a list of the most problematic areas in a restaurant and our recommendations on how to clean them. Kitchen washing usually comes in last on the list in terms of fun restaurant tasks. But keeping kitchen ducts and filters clean is critical for the prevention of fires.1 Tied in with duct cleaning is the health of workers and patrons which is just as important. Hoods and ducts should be cleaned to the metal.2 Start inside by using your pressure washer to give the kitchen hood, duct, and filters and fans a good cleaning. Our new duct cleaners will help you clean your system from dust and general dirt. There are a number of benefits and we delve into kitchen hood and duct cleaning more deeply in our blog post. Floors are generally mopped at the end of the business day. At best, depending on the cleaner and the method used, floors will appear to be clean. However, a much deeper cleaning can be achieved by a unit that cleans a surface with multiple water jets and captures the water. Water recovery units were designed specifically with this need in mind. For example, a 21" Height adjustable Surface Cleaner with Air Recovery allows a direct connect to a vacuum cleaner. The surface cleaner recovers dirt and grime from most any cleaning job and is an ideal solution for indoor food space related cleaning. Many times restaurant owners are so focused on the interior, they forget how important the exterior of the restaurant is to the success of their business. The exterior of the restaurant is the first thing a customers see's first and you only get one chance to make a first impression. Look at your signage. This is an area that is almost always neglected because it's the most difficult to clean if you don't have the right tools. Which is why Telescopic wands were invented. Telescoping wands allow you to reach heights of up to 24 feet and is an easy attachment to hook up to a unit. A clean sign will give your restaurant a clean and professional look! And clean restaurants attract new customers! Be sure to check county and state regulations regarding what is legal in terms of wastewater disposal. Do not overlook the dumpster pad area, as this could be one of the most infested and vile areas on your property. Most dumpster areas have garbage spilling out of bags, fluids seeping out of torn plastic bags and caked on food in and around the dumpster. Not only does this create a smelly, potentially disease ridden area, you are also welcoming rats, cats, bears and other stray scavengers which pose a threat to patrons and workers alike. Use a setting of about 2600 PSI to clean oil spills, grease, excess dirt, chewing gum and other debris from your parking lot and sidewalks. An outdoor restaurant seating area should be cleaned nightly as well. You don't want customers requesting to be seated someone where else because an area is dirty. For extra greasy areas, be sure to pre-soak the surface with a detergent before cleaning with a power washer. Higher pressure may need to be used on chewing gum. Keep your restaurant clean and safe and you'll maximize your chances of gaining new customers and being outrageously successful!